It's based in Paris guys. But nonetheless - those dogs were there. I don't know if this is just me, but I have a habit of being consistently disappointed with reality. Maybe it's a photographer thing, or perhaps it's because I have a very active imagination, but have you ever been so excited to travel somewhere - only to find that once you got there, reality couldn't possibly match up to what you had dreamt up for yourself? In fact, the 'real' version of events was pretty underwhelming and sometimes, quite frankly, a little bit gross. There's a single disregarded croc floating in the sea (dear Lord I hate crocs). The whole place smells weird. THERE ARE PEOPLE. If you've ever seen the film 'Jumper' - you'll remember that scene where he jumps through space and time and lands on the top of the pyramids just as the sun is about to set.Yep. I want nothing less than that. (Go ahead - look it up on youtube). Smoooooothly segway-ing on to the WHOLE POINT of this blog. (Jeeeez Jess). My husband, Adam, and myself - along with my best friend/ adopted brother Joel recently had the opportunity to spend two weeks in Italy with work. 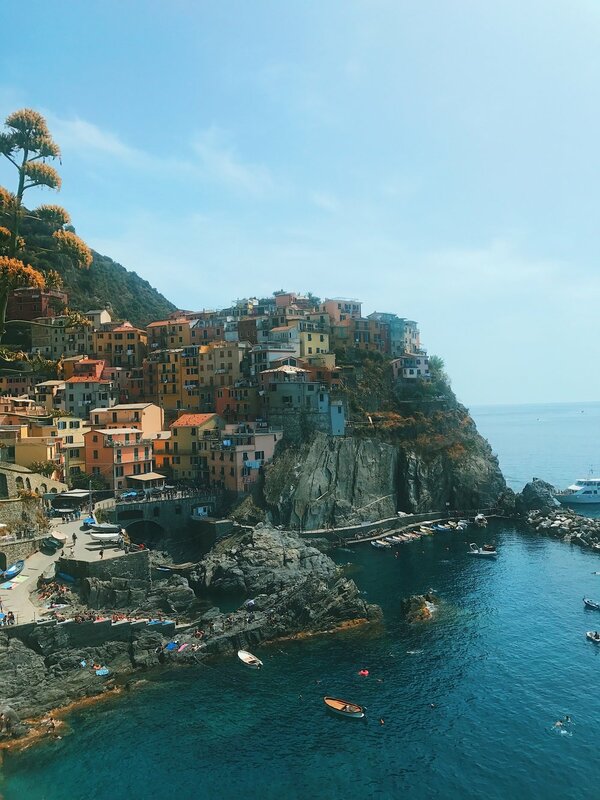 One of the perks of this, of course, is being able to tag on some extra days to explore, and this time our travels took us around Tuscany and the Cinque Terre. Was it the perfect actualisation of all of my childhood dreams? Almost, nearly, yes. (RIP Roger Moore). I could talk for hours about Italy. I love the people, I love carbs, I love the way of life, and I love that every time you go you discover first-hand that it really is all it's cracked up to be. But today, I'm honing in on one particular leg of our trip to bring you some tips fresh off the back of our time in the Cinque Terre. 5 little towns, carved in to the coastal cliffs of North-West Italy. 'Cinque Terre ' means '5 towns' in Italian. How very straight-forward. Thanks Italy. These paradisiacal little corners of the Italian coast are almost too beautiful to be real, as gorgeous as something you'd see on a postcard. But instead, they are totally real & not one bit disappointing. Colourful little houses embellish the stark cliff faces - from the top, right down to the sea. As with anywhere, a good photo can hide a multitude of sins with a clever angle or a slick edit - but the 'Famous Five' were only guilty of one sin - being cute af. 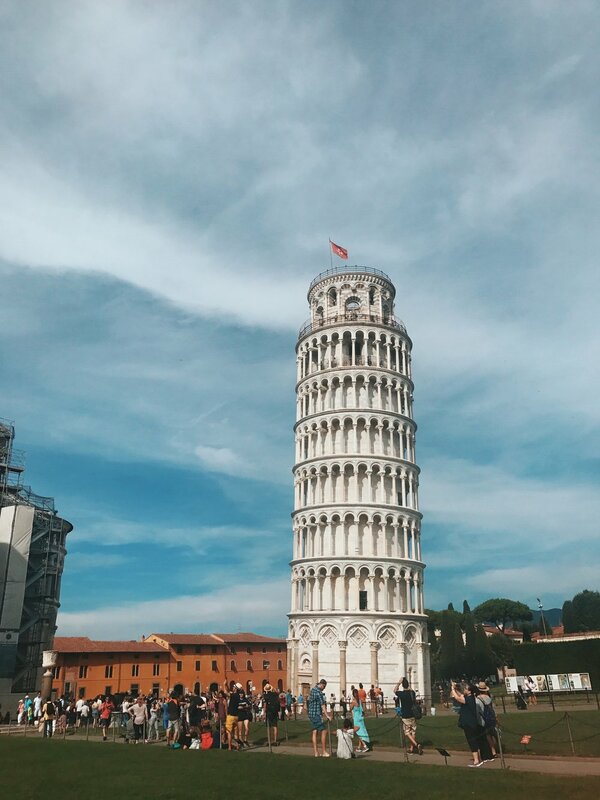 So, if you are dreaming of visiting Italy, these charming towns come highly recommended - although, getting to them isn't super straight-forward. Having learnt the hard way - it was only right to share some advice from our time spent in the area. Which of the 5 towns would I recommend? Well , thanks for asking. The five towns are : Riomaggiore, Manorola, Vernazza, Corniglia, Montorosso al Mare. When Adam and I first laid eyes on Vernazza, the town seemed to have this magical glowy light to it. The sun was beating down on the water, and the candy-coloured houses seemed to stretch right into the sky. The streets were narrow, and bustling with people - but despite the busyness, there was something kind of irresistible about the place. Plenty of gelato to go round, and restaurants right down on the waterfront offering tables with a view. Instead, we opted for a modest (but still classy) melon & parma ham picnic on the beach. Having seen a photo of Vernazza from above, we were keen to take a walk up to find the viewpoint. After ascending the steps to the top of the wrong hill, we looked down on the viewpoint that we had assumed we were heading for. DARN IT. We'd managed to take the wrong path. During certain months of the year you can walk between the villages along mountain paths - if that's your jam (this is not my jam). My favourite part of Vernazza was the waterfront. As the sun begins to set, visitors grab a pizza and a glass of wine and scramble over the rocks to find a nice spot to enjoy the view. There's an unusual quietness, as if everyone has mutually agreed to it, in appreciation for this one- off masterpiece in the sky. The sea lapping the shore and the last rays of light sparkling off the water - could it get any better than that? By car or by train? We'd driven along the most secluded mountain roads to get to these towns, meandering down the edge of rock-faces with only the screenshot of Google maps to navigate by. It has to be said that we felt pretty badass when we reached the end of the road. Invincible, if you will. We'd half-expected to be the only people in these towns - considering we hadn't seen a single living soul on the road for the last hour. Ah, alas... there's a train that goes straight into the centre of each town. 😑 Great. Guys - only drive if you're up for an adventure. We saw snakes, we passed vans on roads only built for half a car, we got a parking ticket, and we walked for miles up and down hills to get down to, and back from these towns. If you're hoping to visit a number of the towns in a day - the train is your best option and takes only 10 minutes to get between the villages. The trains go through the mountains... your car does not. What and where to eat in Cinque Terre? Cinque Terre is known for its fresh seafood. If that's what you're into, please - go ahead. Eat that fish. But, for me Nessun Dorma, Manarola takes the prize. Just a short walk from the town, with breath-taking panoramic views & the best bruschetta in the whole of Italy. (Please note: I've only ever eaten Brushchetta once.) Nevertheless - this place is a must. If you're planning to take a trip to Nessun Dorma - try and time your visit to arrive just as the sun is beginning to set. We went at midday and the shade is super limited up on a hill at this time of day (naturally) and this was only going to end one way ; sweaty bruchetta. It's not cute. Don't do it. Other than that, pizza & gelato is always only just around the corner. As always, if you have any questions - or are planning a trip to Italy - why don't you leave me a message in the comments below. Help is always given at Hogwarts to those who ask for it. I won't hand this info out to anyone - I promise.